A fabulous day was had by all at the official opening of The 8010 Skate park last weekend. The opening saw a fantastic turnout with young skaters excited to see their new skate park in Springhead Park officially opened. Lots of young people wasted no time in enjoying trying out the new ramps. The new design features a 1.4-metre quarter pipe, flat bank hip, Miami bank, pump bump and down hubba suitable for skateboarders, roller skaters, in-line skaters, BMX riders and scooter riders. 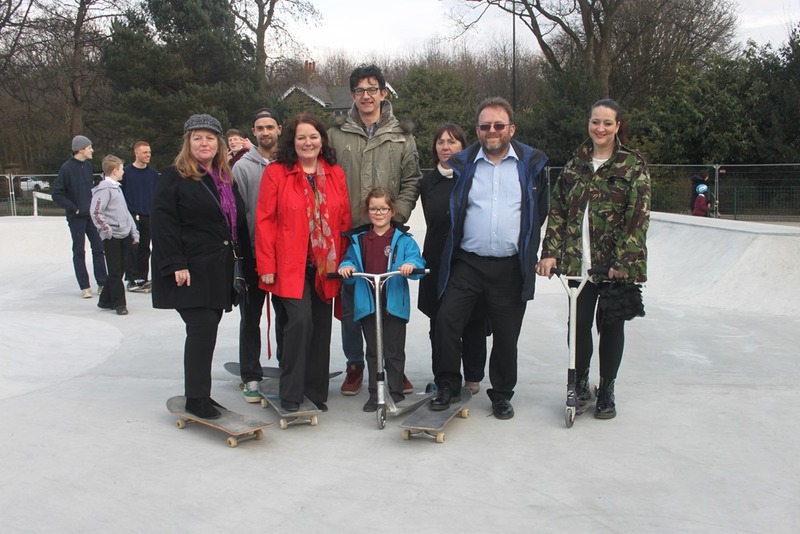 The new skate park is a result of a great community project by the 8010 group, Groundwork,, Leeds City Council and local councillors Cllr David Nagle and Karen Bruce. The £112,000 community skate park has been created in memory of a late Rothwell skater Daniel Parrinder, who died tragically in a car accident in 2014. The campaign was initiated by young skaters who contacted myself and David Nagle and we were keen to get on board to help drive the project forward and make it happen, there followed many months of fundraising. e making the most of the new skate park over the Easter holidays and no doubt it will see great use this summer. We want young people in Rothwell to have the best modern facilities and we were pleased to be able to help raise the necessary funding to enable the project to go ahead. The new skate park is fabulous. We’re proud that young skaters spearheaded this project, it is a real credit to them. The 8010 Association-led campaign was supported by the Groundwork charity, Leeds City Council, local ward councillors, The Works skate board charity and Mondegreen which use landfill tax credits to provide funding for community projects. Daniel’s Mum Marcia carried out the official opening, she gave a moving speech at the opening and cut the official ribbon. More photographs of the opening are on the Rothwell News facebook page at http://j.mp/8010skatepark. This entry was posted in Environment, Family, Health, Housing, Leeds City Council, Rothwell, Young People by Karen Bruce. Bookmark the permalink.